Okay so we are getting confused if it’s ‘LG Miracle’ or ‘LG Fantasy’ but more images of this yet-to-be-announced device have been leaked. It was back in December when we first saw the device getting leaked, and then just two days back we shot a press-shot of the device getting leaked and today we see more of it. 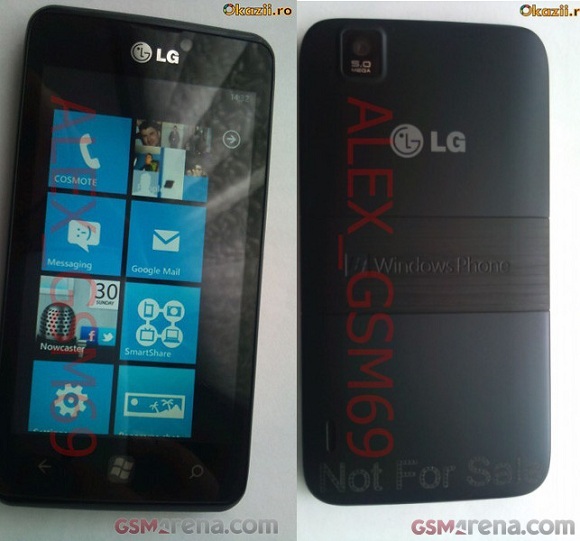 This time GSMArena has been able to get pictures of the ‘NOT FOR SALE’ prototype device with Windows Phone OS running on it. These pictures of the device were probably posted over a Romanian trading website titled as ‘LG Fantasy E740’ and later removed quickly but we still get to see them. The device is running WP Mango and also has the ScanSearch and SmartShare apps that were previously exclusive to the Optimus 7. Going by the specs, LG Miracle/Fantasy will have a 4 inch WVGA NOVA display, 1GHz Snapdragon processor; 8GB of onboard storage, a 5 MP camera at the rear and front facing VGA camera. The Fantasy/Miracle will have a HSPA radio on-board, 5.0 GHz capable 802.11a/b/g/n Wi-Fi and Bluetooth 3.0. Also there will be NFC tag-reading ability in the phone which will arrive with Windows Phone 8 only but is also logical as sometime or the other it’ll receive the update. So for now we are keeping our eyes and ears open for LG to announce the device anytime soon, probably at the Mobile World Congress (MWC).